Hi there, moving right along through the Altenew Educator Certification Program and this lesson focused on scene building. I must admit that I've seen this technique done many times, but I've never actually done it myself. For this project I used the Altenew Garden Grow stamp set because I love it and have owned it for awhile but haven't had ideas for how I wanted to use it. Nichol Spohr used this set in some of the lessons and I was inspired! I also used my Copics, which I rarely do, so this was really a useful lesson for me. I first decided that I wanted to build my scene making it appear to be inside of a garden potting shed. I pulled out the Altenew Wood Pallet stamp set and set it aside. 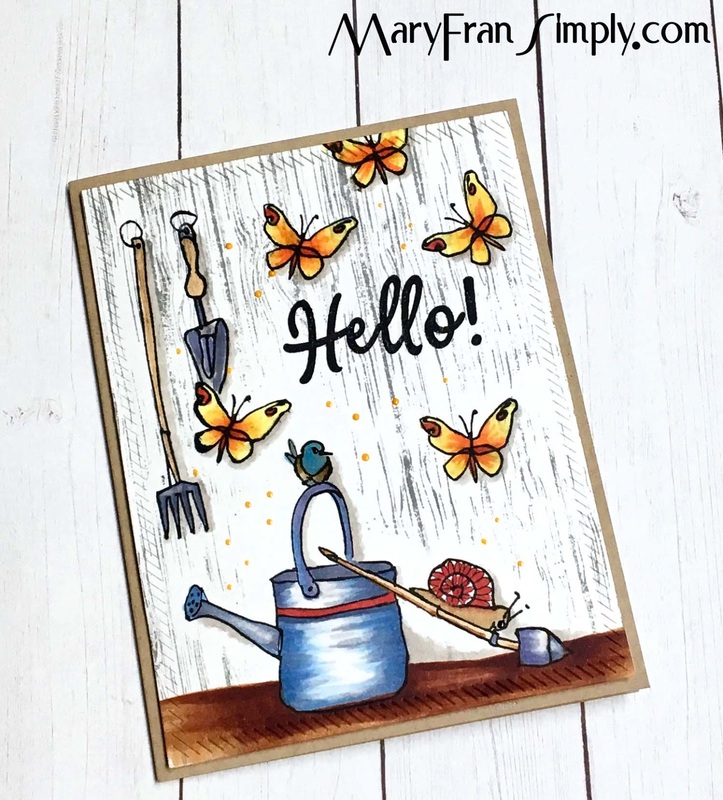 Next I stamped all the different elements, i.e., garden tools, butterflies, snail, and watering can onto some Inkadinkadoo masking paper and die cut them. Next I built my scene and this was just a delightful process. Stamping the item that I wanted to be in the front first, applying the mask, and then moving on. Lastly, I stamped the background in gray ink and stamped the 'Hello' from the Altenew 'Halftone Circles'. I did not mask the background for the butterflies, but instead made sure to color them over until the gray ink did not show. I used some Ranger Enamel Drops in a yellow to match the butterflies, die cut the panel with a slanted rectangle die, and mounted it to a Neenah Desert Storm cardbase. Thank you very much for reading. Lovely card Mary!! What amazing details you added to the project. Thank you for submitting your creation to AECP gallery!